I refuse to be melodramatic about it. It being a ‘lost’ picture. I took many pictures of food yesterday and then Jeremy took some of the cool moon in the duskish hours of the day. Lo and behold a few were mistakenly deleted. I was sad for a few minutes because the quinoa was really good and I wanted to post the recipe. I decided to post it anyway – you’ll just have to trust me that it was delish! I hope this cartoon rendering does it justice and inspires you to make it anyway. Prepare Quinoa according to package instructions. For Bob's Red Mill - I didn't need to rinse it first - yay! Bring 2 cups of water to a boil in a 2 quart sauce pan. Add 1 cup Quinoa, bring to a boil, cover, cook over medium heat for 12 minutes or until Quinoa has absorbed all the water. Turn heat down to low and fluff Quinoa with fork. First drizzle in olive oil, then add in your onions and garlic, tossing and stirring to get them sauteed. Next add remaining ingredients and mix well. Saute and mix until everything is warmed up again, 2-5 minutes. Finally, remove from heat, serve, and enjoy! I’m pretty sure this took me around 25 minutes to make, just so you know. I would say the recipe is versatile too based on ingredients you have on hand. We even had sliced avocado on the side. Feel free to use dried beans if you have them. I’m not above canned beans but I also don’t eat them every day. I do rinse mine very well, this helps get rid of additional sodium. This is especially helpful if you can’t find sodium-free canned beans. This dish gave me that comfort food feel, like I’m talking about ‘the pasta realm’ of comfort and if you like Mexican type food its full of those flavors too. The nutritional yeast can be left out but it does give it a nice cheesy taste. While eating this, I was even bragging to a friend about how great quinoa is! 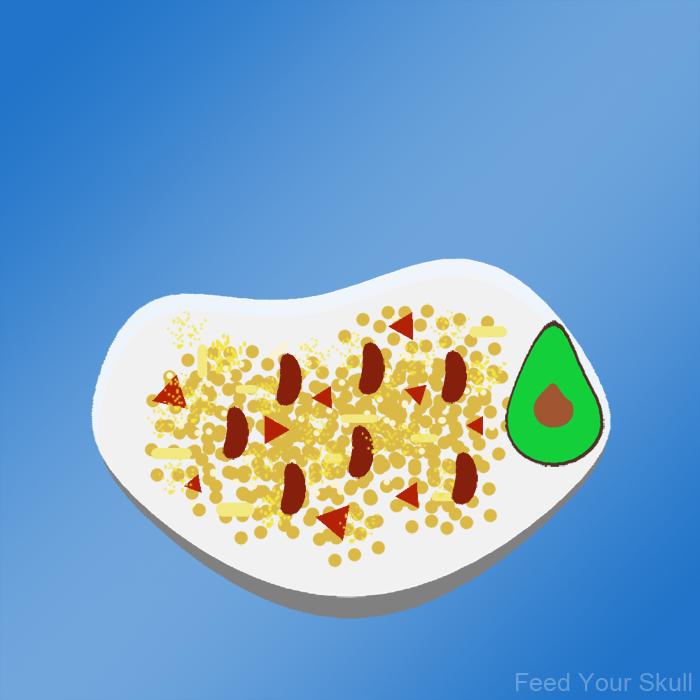 It’s a grain, a complete protein, high in fiber, source of iron, and low fat. Sounding more like the intro to a cartoon super hero to me. I felt pretty super powered after eating it – that’s for sure – and it was damn tasty. Hard to ask for more than a quick and easy, healthy comfort food dish, right? What’s your favorite way to eat quinoa? I also like to sprout it and mix it with chopped parsley, olive oil, garlic, tomatoes, and sesame seeds for a tabbouleh. Yum! P.S. Don’t forget to enter in a chance to win a Sun Chlorella sample pack! Laughing AND smiling but NOW I want to see the picture….OOPS, never mind. This too, as all your other recipes, sounds delish. LOVE kidney beans. Thank you for sharing! 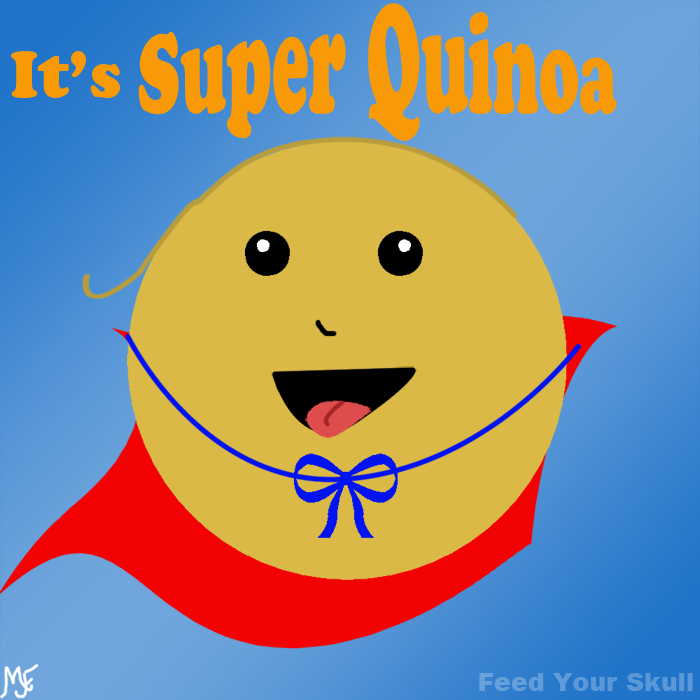 super quinoa!! Sounds really good.